Have you and your friends ever sat around the gaming table wanting an exciting, perilous dungeon adventure but no one wanted to be the Gamemaster? Do you find yourself with little time to read through lengthy adventure modules and memorize them? Do you want to get down into the dungeon as quickly as possible and start killing monsters and finding treasure? 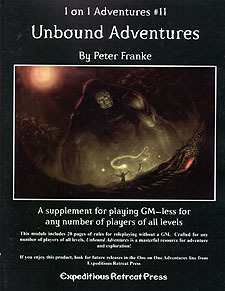 Then look no farther than Unbound Adventures!